Contains: Chamomile, Lemongrass, Orange Peel, Lavender, Rose Petals and Hibiscus Flowers. Adding oil directly to this product may cause mold and/or fungal growth. 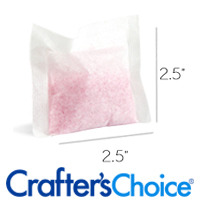 If you desire to scent the bath tea with fragrance or essential oils, we suggest making scented bath salts with tapioca starch. Once fully dried, blend with the bath tea. Do not drink this tea. It is for bathing only. Rosa Centrifolia (Rose) Flower, Hibiscus Sabdariffa (Hibiscus) Flower, Matricaria Recutita (Chamomile) Flower, Citrus Aurantium Dulcius (Orange) Peel, Cymbopogon Citratus (Lemongrass) Leaf, Lavandula Angustifolia (Lavender) Flower. 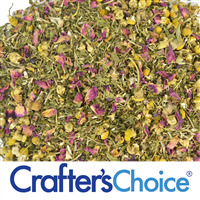 Rose Flower, Hibiscus Flowers, Chamomile Flower, Orange Peel, Lemongrass Leaf, Lavender Flower. 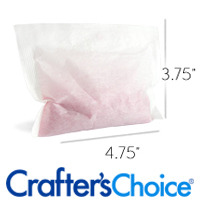 Place tea in a bath tea bag and heat seal with a household iron. To use, place tea bag in a warm bath. COMMENTS: Great bath tea and it smells amazing! I used to mix my own but this is easier and more economical. I bought three of the blends and love them all. The bags are really large too. Thank you! COMMENTS: I use this in my bath salts and bombs. It is my number one requested botanical blend. Very aromatic with calming attributes. I've tried several other blends but this is my go to. COMMENTS: I love this Bath Tea! I use it in soaps and in Bath Tea Bags. Has such a wonderful natural fragrance. COMMENTS: This is a nice blend and you get quite a bit! I’ve made 30 large bath teas so far and still have half a bag left, can’t beat that for the price! Part of the bag was crushed in shipping, if you are counting on every ounce you may want to request extra packing. 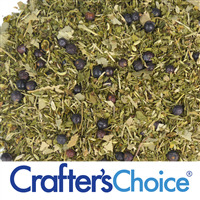 COMMENTS: This bath tea blend smells incredible - I use no added fragrance. 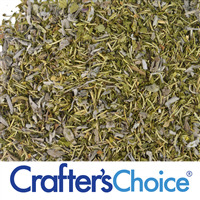 I mix this with sea salts and add a drawstring bag to strain. Will order again! COMMENTS: I love using this in my bath tea bags. Lovely scent and beautiful colors! COMMENTS: This is a beautiful blend and smells lovely. I used it to top a rebatch cp soap made with herbal tea. COMMENTS: I like this bath tea the most out of all I've tried so far! It reminds me of a warm summer night sitting on the veranda . COMMENTS: I am planning on making bath teas with this. COMMENTS: I LIVE EVERYTHING ABOUT THIS BATH BLEND. The smell is awesome alone, the amount you get for a 2oz bag and the quality of the ingredients is by far the best I've seen in a while. The look amazing in my soap and bath teas. Very pleased with this product. COMMENTS: This has became one of my favorite products. I mix with some Epsom salt and done! Love the earthy smell! Totally recommend. Will be ordering again! "Summer Nights Bath Tea Blend"
COMMENTS: Boy oh Boy!!! I can't describe in words the love I have for this tea!! it smell amazing and my customers LOVE it! I had it for a while and just decided to put it out in the spring and by the time I put it out it sold so fast and now WSP is out of stock. As soon as stock hit I plan on getting much more of this amazing tea. I had a chance to relax and soak with it using a little Olive oil and it is wonderful! COMMENTS: I love to use this blend for bath teas. It looks very pretty. COMMENTS: It smells nice and I got a few uses out of this product. COMMENTS: I use Summer Nights in my Tub Teas. I put 2 TBL's in a large press and seal tea bag along with epsom salts and oats to make a creamy, luxurious bath. My customer's love it. I don't add fragrance or essential oils but you certainly could do so. The scent is gorgeous and natural as it is. COMMENTS: The combined fragrances of ingredients in this bath tea is wonderful! Very relaxing! Will definitely keep ordering this!
" 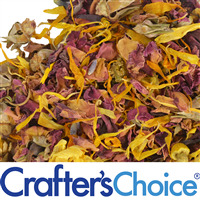 Crafters Choice™ Summer Nights Bath Tea Blend"
COMMENTS: This is the first time I've ordered any bath tea botanicals from crafters choice and I have to say I am totally delighted with the Summer Nights Bath Tea. It contains whole pieces, not alot of powdery left over and not faded. Its very pretty in my salts. I package in a nice jar glass jar which looks very high end. I will buy lots more! • Its fresher than other companies. COMMENTS: This is a beautiful blend for bath teas. I added powder milk, kaolin clay and Epsom salts and a bit of fragrance to it. I initially had a hard time getting the bags to seal without breaking open easily, but I switched to using a hair straightener at a higher heat(395 degrees) and they sealed perfectly. This tea already has a nice natural scent to it, but if you do want to add fragrance mix it with salts of clay and make sure it's thoroughly dry before sealing in the tea bag. "Is this formerly known as the "Luxurious Bath Tea Blend"? Or is this different?" Staff Answer This is slightly different than the Luxurious Bath Tea. That blend contained Chamomile, Cornflower Petals, Calendula Flowers, Lavender, Rose Petals, Hibiscus and Orange Peel. Our Summer Nights Bath Tea contains Chamomile, Lemongrass, Orange Peel, Lavender, Rose Petals and Hibiscus Flowers.